The sun was out but it was as low as -4 degrees F with a wind chill of -20 F on Chautauqua Lake just over a week ago. The lake was frozen, snowmobile trails were open and numerous ice fishermen were braving the cold. But, then it warmed up with sun and up to 55 degrees F. Most of the snow melted. Now its 20 degrees and snowing again. That’s western New York! Before we forget…Dr. Tom Erlandson, Partnership Biologist, and Jim Wehrfritz, Partnership Vice President will be interviewed by The Robert H. Jackson Center’s Greg Peterson, on Tuesday, February 26, 2019, at 6:30 pm in the Turner Community Center on Route 394, Chautauqua NY. Please plan to attend. Your Partnership Officers and Board Members have been very busy getting ready for summer 2019. We are working towards a truly “Partnership-Amazing” summer with expansion of the Partnership-supported municipality-based weed managementprogram, mechanized shoreline and near shore weed fragmentmanagementand major university/Partnership-supported solutions for identifying algae and algae management, focused on major nutrient sources feeding cyanobacteria (blue-green algae) and its toxins. We’re working hard raising funds from individuals and businesses and seeking funding from government and foundations to finance Partnership efforts. 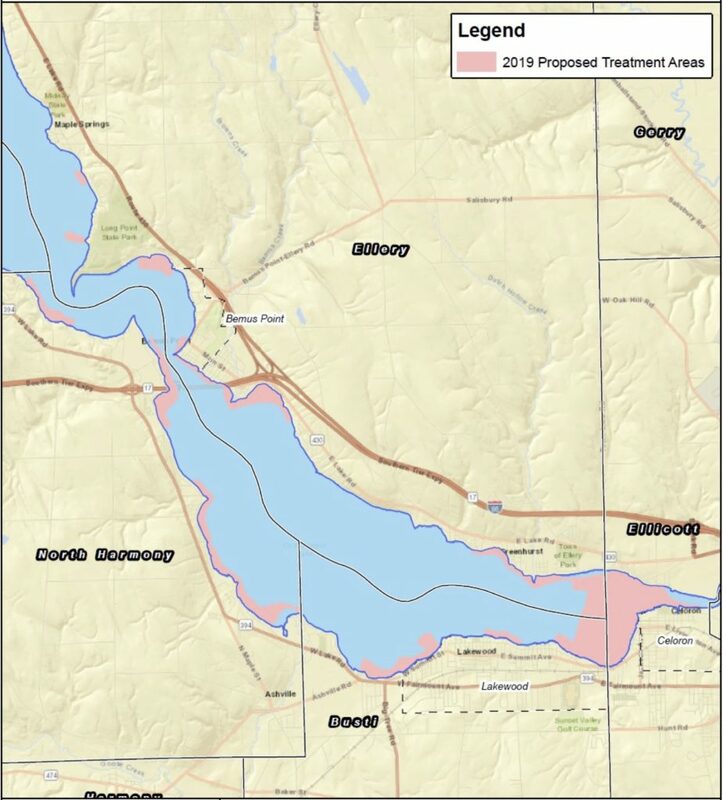 Permit applications to use herbicides to reduce invasive weed populations in many areas of the lake have been submitted by the Towns of Ellery (includes the Village of Bemus Point), Ellicott, Busti and North Harmony and the Villages of Celoron and Lakewood. Treatment plans have been developed based on an August 2018 Weed Survey and in-lake observations. The $35,000 Survey funded by the Lenna foundation was designed to meet New York State Department of Environmental Conservation (NYSDEC) requirements and was the third weed survey sponsored by the Partnership in the last two years. More than 1300 weed type/density and water depth measurements covering over 3000 acres of Chautauqua Lake’s littoral (shallow water weed-growing) zone were taken. Weed of one or more species were found at 69% of the survey locations with a total of 25 species of aquatic plants (weeds and algae) located. Several large beds of primarily Eurasian Water Milfoil were identified including in Burtis Bay, site of the October 2018 fish-kill which resulted from excessive Milfoil growth and fragment accumulation. 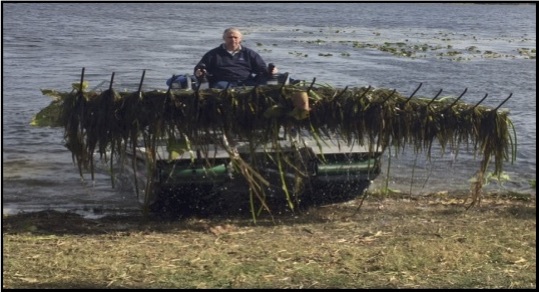 In Burtis Bay, survey crews had to skip water depth measurements and transfer to airboat due to the heavy growth of Milfoil which made propeller-driven transit impossible. 2019 herbicide permit applications have been submitted a month and a half earlier than in 2018 seeking permits in plenty of time for late-April herbicide treatment when target weeds are just starting to grow, environmental conditions are the best and peak use of the lake is still two months in the future. Letters of Notification, including more specific treatment information and including maps showing anticipated water use restrictions, have been sent to ~2000 property owners along approximately two-thirds of the Lake shore and along the Chadakoin River and Cassadaga and Conewango Creeks downstream of the Lake. Unfortunately, the Partnership’s year-long efforts to collaborate with the Chautauqua Lake Association on a combined herbicide/environmental impact-mitigated weed harvesting program for 2019 were unsuccessful. However, County Executive George Borrello is now working towards a “consensus weed management strategy” combining weed harvesting and herbicides. Towns, Villages, lake organizations and others have participated in focus groups sharing their views and concerns. The Partnership supports Mr. Borrello’s initiative. The second Partnership focus area is weed fragment management. The Partnership’s near shore and shoreline cleanup plans evolved in 2018. The County purchased the Partnership-preferred MobiTrac (see photo) with $100,000 in New York State grants identified by the Partnership with Senator Cathy Young and Assemblyman Andy Goodell in early 2017. With this and additional purchases and deployment, the current approach using “kids in the water with pitchforks”, inefficient and not sustainable with the cyanobacteria toxin risk, will be replaced with efficient and safe amphibious equipment. The Partnership will now work with the Town of Chautauqua, recipient of the County’s MobiTrac, and the County seeking equitable lake-wide MobiTrac use, and, potentially seek the acquisition of additional MobiTrac’s for other Towns and Villages (The Town of Chautauqua has already bought one of their own. That means two MobiTrac’s will be on the lake in 2019). We’re also excited about the 2018 weed fragment experience in Bemus Bay. With herbicides targeting invasive weeds in 2017 and 2018, weed harvesting has not been needed or used since June 2017. As a result, there was much less weed fragment accumulation. Weed fragment pickup required along the Bemus Bay shoreline was reduced 90% from 2017 to 2018 and Bemus Bay boaters, skiers and fisherman didn’t encounter floating weed masses. Algae management is one of the several main thrusts of CLP’s comprehensive strategy for seeking a Greater Future for Chautauqua Lake. 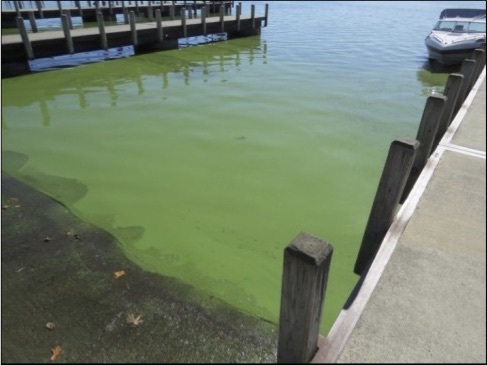 Those familiar with the lake’s problems are aware that when we use the term “algae” in this context we are referring to cyanobacteria, a group of organisms formerly known as blue-green algae. Several genera and species of these single-celled and colonial pigmented bacteria are commonly considered today under the term Harmful Algae Blooms (HABs) because they produce various toxins that are harmful to humans and other warm-blooded animals, including our pets. These harmful aquatic organisms are of major importance to human health and lake management and the Partnership Is actively seeking solutions to the problem. Partnership representatives have attended several state, regional and county meetings in 2018, including March 26th at the WNY HAB meeting in Rochester, April 19 at the Chautauqua Lake HAB meeting in Mayville, and October 20th at the regional NYS Federation of Lake Associations meeting in Perry. Along with these connections, we have teamed with university biologists and engineers in a project to address the phosphorus sequestered in the bottom sediment of Chautauqua Lake. This sediment phosphorus, known as internal loading, is THE MAJOR (54% of needed reduction as mandated in the Total Maximum Daily Load for Phosphorus in Chautauqua Lake) and constantly-released source of that nutrient, which, along with nitrogen, is necessary for toxic cyanobacteria blooms. This “legacy phosphorus” was a focal point of the all-day conference and workshop organized by the Partnership held at The Lawson Center in Bemus Point on January 10th. The Partnership’s Lawson Center conference included a morning science-based workshop focusing on a Partnership-sponsored project to identify legacy phosphorus “hot spots” in Chautauqua Lake led by Dr. Tim Davis and Dr. George Bullerjahn of the National Science Foundation-funded Lake Erie Center for Fresh Water and Human Health. The Center, including nine well-known universities, intends the Chautauqua Lake project as a prototype for western Lake Erie application. Identification of Chautauqua Lake phosphorus “hot spots” and their removal is key to the needed reduction in the lake’s “internal loading” source of the algae-feeding nutrient. The second phase of the Partnership’s plans in this regard is focused on that removal. The conference also included a science-based workshop focusing on a Partnership-sponsored project to evaluate the socioeconomic and environmental impact of agricultural nutrient runoff into the lake. Agricultural phosphorus runoff reduction accounts for 25% of the overall needed phosphorus reduction. This study will be led by Dr. Joe Atkinson, Professor and Chair, Department of Civil, Structural and Environmental Engineering and Director of the Great Lakes Program and Dr. Michael Shelly, an Environment/Ecological Economist from the RENEW Institute, both at SUNY Buffalo.